The Amish Old Fashioned Buckboard Wagon-Large Rustic adds a connection to a past time for your outdoor decor. This solid wood beauty has a wide open wagon area, a solid wood seat and your choice of wheel style. This buckboard wagon can be converted to a sleigh! Parties--you've got an outdoor portable bar right here! 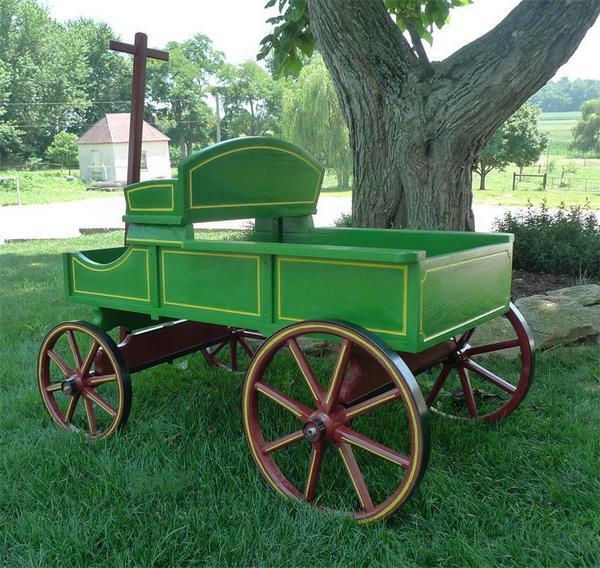 We get excited about custom furniture like our Buckboard Wagons. There's so much you can do to make them your own unique design! Select your options online or feel free to get in touch for help from an Amish Furniture Specialist. Thank you for shopping with DutchCrafters, the home of the largest collection of Amish furniture available online. Height from floor to top of the sides of the bed: 25"